Whether you’ve owned your home for thirty years or three, chances are you’ve noticed a crack or two in your basement or foundation walls. These wall cracks are common occurrences, but that does not mean they should all be left alone. Wall cracks, especially large horizontal ones or ones that gape open, are an indicator that your home is in need of foundation repair. They are also a hazard to your home, allowing in unwanted moisture and pests such as snakes, insects, or rodents. Horizontal cracks are often a sign that the soil around your home is causing too much pressure to be pushed against your foundation walls. This can also cause bowed or leaning walls in your basement. 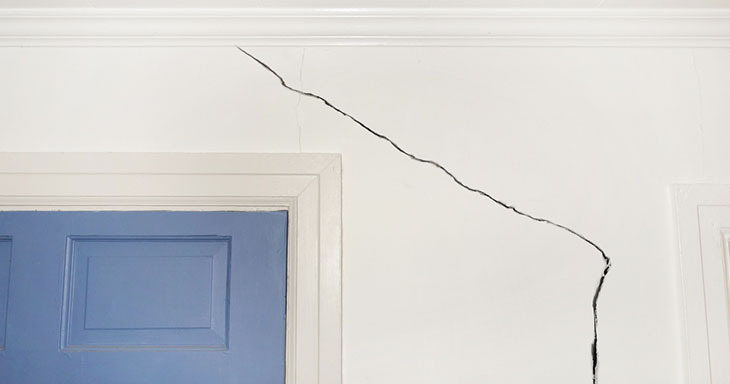 Wall cracks may also come from the corners of jammed or sticking doors, a key sign that your home would benefit from KC Pro’s foundation repair services. Wall cracks in your basement can be both unsightly and unsafe. If you’ve noticed them around your home and would like an expert opinion, give KC Pro a call. Our services range from helical tieback installation, which will keep the expanding soil from putting too much pressure on your walls, to wall crack injections, designed to be a permanent resolution for wall cracks that allow in bugs or water. We use only the best ECP products, ensuring the quality of your foundation repair job. If you’ve seen wall cracks around your home and would like an expert opinion, its time to call KC Pro. Our knowledgeable staff can look at your home and find the best solution, whether it be something as extensive as helical piers or something as simple as wall crack injections. Don’t let the wall cracks in your basement threaten the structural integrity of your home. Call KC Pro today.